Elephant Bedroom Camp is set on the banks of the Ewaso Nyiro River in the Samburu National Reserve in Kenya, surrounded by doum palms and other beautiful indigenous trees and shrubs. 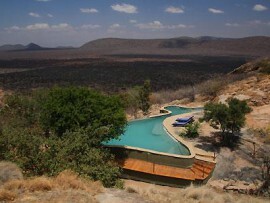 Elephant Bedroom Camp is 347 km from Nairobi. 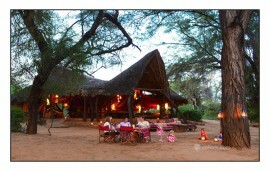 Samburu is about 1.5 hours scheduled flight from Nairobi. 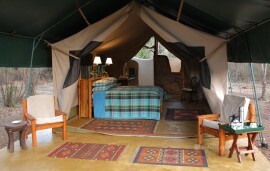 The small, exclusive Elephant Bedroom Camp has 12 luxury tents – all furnished in rustic African style while offering all the comforts expected of a luxury Camp (hot & cold running water, electricity and writing desk herbal products.Inside the tents are lounge chairs, coffee table, writing desk and comfortable king sized double beds or twin beds.